Just had a weekend with my friends in Hartfield. Had coffee here Sat morning, 74p for two! As you have not phoned I hope it means that all is well with you. Have had a spot of bother with car and flat is freezing so have not been in touch. On Friday we were told the office would close end of August – well at least they have decided on a date. If you have no other plans, perhaps you’d like to spend your Birthday weekend at Sidcup. Let’s hope it will have warmed up. Please let us know when you can. 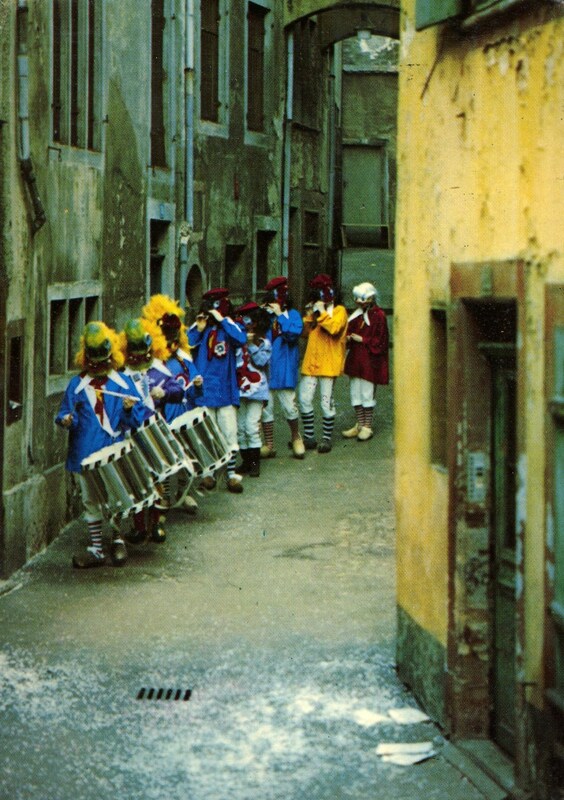 In March 1982, Francis and Theo visited Switzerland for the four-day Basel Fasnacht or Carnival. During their stay, Francis bought a postcard depicting a masked group marching through the streets of the old city, dressed in striped stockings and brilliantly-coloured smocks, and playing pipes and drums. before signing the card and posting it to a friend in London.